Designed for safety, comfort, and convenience, this shower bar is an ideal addition to any shower or tub wall. The jumbo suction cup bar is longer and wider than many other shower grab bars, making it easier to grasp. High-quality suction cups hold the shower bar firmly in place, so you can use it with confidence. This tub grab bar is the helpful assistant you need to make bathing less of a chore, restoring your independence and sense of safety. Simply position the bathtub safety bar in a vertical, horizontal, or diagonal position on your tub or shower wall, then flip down the tabs to solidly engage the dual suction cups. Flexible positioning makes it easy to customize the shower grip bar to suit your needs. It’s easy to position and install; removal requires just a quick release of the flip-tabs. Extended length and greater depth make this tub and shower grab bar easy to see and grasp for those with limited sight or range of movement. Supports up to 300lbs; measures16" x 4" x 3 1/2". Item was very easy to install. It certainly makes me feel safer getting in and out of shower/ tub! This item assisted my 89 year Dad in and out of the tub securely. He was not afraid of falling and enjoyed the freedom of not asking for assistance. You will need someone with strong hands & arms to put them, but they stay put. They have helped to stabilize my balance & I have not slipped since applying it. I use it with the smaller one to allow me to move around with confidence. I recommend it. I would buy this assistant bar again . We use this assistant bar in the master shower & it works great. My mom had u issue getting into the tub/shower with this handle she has less problem getting I would recommend this product to anyone who needs help getting in or out of shower . I installed this in the glass enclosed shower stall so that I have something to hold on. This bar was so easy to put on and its suction was unbelievable. Unit is very sturdy and has a nice grip to it. I will buy another one for the other bathroom. Use it for the Master Bath we both like it just for the conveience of it. Provides additional safety in the shower. Bought this bar and the smaller one a little while ago. I was apprehensive at first, but quite surprised with the sturdiness and attractiveness as well. The suction really holds on tight. Love it! I injured my knee a couple years ago and could not get into the shower without my husband's assistance. I decided to have back-up for later use but I use it everyday whether I'm lame or not. Recently my son saw these in our shower and showed an interest so I ordered two for him. I liked, and I would order it again. My husband has parkinsons, and it has been much easier for him to shower with something to hold on to when he gets up from his stool. He feels safer. We recently took this on a trip to France and England because many of the showers are in very high tubs which are dangerous to step in and out of. Although you shouldn't put all your weight on this temporary (not fixed) grab bar, it provided safety in getting in and out of these tubs. We will take it with us from now on wherever we travel both in the states and abroad from now on. This grab bar is exactly as advertised, easy to install, and gives me a real feeling of safety getting in and out of the shower. Shower necessity for getting in or out of a bathtub or shower! Easy to install and stays put on the wall. Seniors really appreciate this very useful item. my husband needs it to help him stand up. This handle is well made and will be a welcome addition to my B & B baths as needed for that extra security a guest may require. Just wish there was a choice of color (off-white would be great) as the white does stick out a bit more than I would like to see. Still highly functional when needed. I started using mine when I broke my right arm. It made it easier to get into and out of the shower or tub. The next year I broke my leg. It was just as useful helping me in an out of the shower. I gave one to my sister when she had back and neck surgery. It helps her as well. Great for anyone to assist getting in and out of a shower or tub at any age. We use it in master bath to help me stabilize myself in and out of the shower. It works better than expected. THIS PRODUCT IS GREAT. IT HELPS BALANCE YOU IN GETTING IN AND OUT OF THE TUB OR SHOWER. I ONLY WISH IT CAME IN A LITTLE LONGER LENGTH AS THEN I COULD HANG THE BATHTUB MAT OVER IT. Really helped my 87 yr old Father in the shower! It does what I wanted it to do! I wanted this to put up near the hopper to help an elderly person up but that would mean pulling on it and the directions said not to do that and it has a lot of restrictions, so it wouldn't work for me and I will be sending it back. BUT it may work for someone else. Broke when I tried to install it. This grab bar did not permanently adhere to the tile shower wall. After installing, the suction released and the bar fell off after a minute or two. I kept reinstalling it and the same thing happened every time...I even tried glueing it with Crazy Glue and it still fell off. Not recommended..Sending it back. I need a grab bar to get out of the tub/shower, but this won't work for me. The suction won't hold. I put it on, and 10 minutes later it falls down. If it falls down with no one touching it, it sure won't be something I can hold on to to get out of the tub/shower. Installed on bathroom tile...fell off after a few days. Tried another location...fell off again! I could not trust it to stay locked in the bath tub area. my wife has back problems and needs support getting in and out of the tub. this product slide off the wall in the tub when she tried to use it. Does not stick to ceramic tile in our bathroom. A waste of money. I need one of these in my shower, and this product looks like what I need, exactly. Ordered these items for someone who is disabled and expressed a desire for them. My husband has a balance problem I hope this helps. To help steady me when I'm in the shower. I ordered this for my mother. to keep me from falling in the shower. I don't want to fall in the shower at any age and this is so easy to install! I need something like this, and read the reviews then decided to purchase. My husband said it looked secure. Hopefully it will be. I chose this order for safety in getting out of tub or shower. I already have one given to me and it works really well so I want one for my other bathrooms for guests convenience. 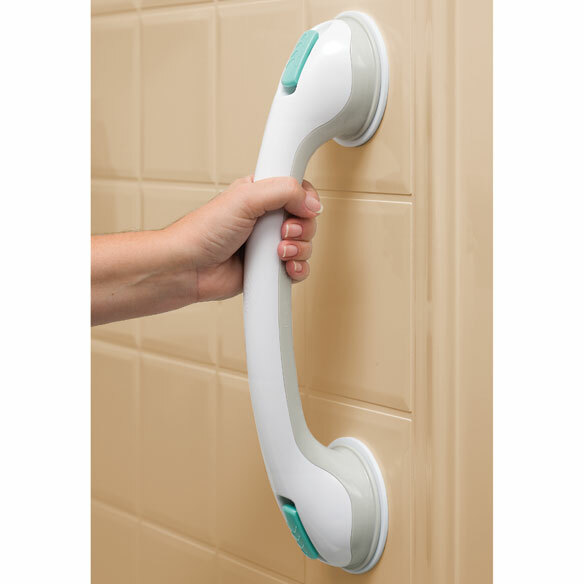 This suction cup grab helps seniors to be more stable in the bath. Have ordered one before. Works well, decided to install another for convenience. Good product! My husband cannot get up in the tub without assistance. My aunt already had one and likes it so much she wanted to get more. I searched many sites for this and your site had them in stock. Thanks! It will make taken a shower easier for my husband. This will be nice to increase stability for my husband who has major back pain. My mother needs help getting into the tub. Need help for balance in shower. I chose this item because when we have to bath our stepfather, he will have something to hold on to when in the shower. Will this work on ceramic tile? BEST ANSWER: It does but it does not stay up indefinitely. After a time, it will fall requiring that it be attached again. i need one 30" long ? BEST ANSWER: Thank you for your question. We do not sell one that long. We hope this information will be of help to you. What is the largest ceramic tile square on which this will fit securely? BEST ANSWER: Thank you for your question. The Suction Grip Tub Assist Bar 16" is 3 1/2" wide. We suggest to have the square to be at least 4" or more. We hope this information will be of help to you. Will this hold on a regular painted wall, in the hallway on the way to the bathroom? BEST ANSWER: It can if you have semi-gloss or high gloss paint. Not flat paint. I would not use it for full support just as an assist to steady ones self. I only placed them on the shower wall. I think they would hold on the painted wall.